StarCity International (SCI) is a totally new and innovative concept of living. It touches and redefines every known aspect of urban design, social life, governance and economic. Imagine housing 600,000 people under one single roof! It is now possible with the new technologies available today! As everything will be close to you, there would be no need any more for cars, parking lots, gas pumps, driveways... or any other car's related polluting or space/energy consuming things. StarCity International (SCI) has the highest ecological and energy efficiency of all the cities of the world. Built in the countryside, you are always only few steps away from walking into the nature and enjoying the wildlife. Food is always freshly grown and produced at your door step. Using the newest technologies and science available today,StarCity International (SCI) is designed to minimize the pollution generated from the daily activities and convert what is already polluted into a clean ecological system for the society of tomorrow. StarCity International (SCI), with its green renewable energy sources, is self sufficient and can even supply the power grid with its unused power production surplus. Volunteering, Open Source philosophy, Art and science are at the heart of this new form of social organization where the governance is promoting the human genius. Life within this very high technological city, contributes to improve personal development in a money free internal economy where many daily duties are done by robotic and automated systems. StarCity International (SCI): “science for Better Life”, the social revolution of the 21st century. StarCity International (SCI) is born from the need to adapt to the current global technological, social and economic changes that are taking place in the world. We live in an era in which science and technology will prevail and become the driving force of change. Therefore our goal is to create a scientifically evolved society that is non-political and free from all racial or religious distinctions. We believe that the creative power of the human brain is the most precious natural resource on this planet. This is why we are aiming to have, from all around the world, scientists and all the supporting staff, to work and cooperate openly together in order to ceaselessly push back the frontiers of knowledge, science, innovation and technology for the sole benefit of the entire population of the planet. All the denizens of StarCity International (SCI) will work on a voluntary basis but, they will in return, enjoy an unrivalled life style where everything, made and created by them, will be freely provided to all of them; from basic living necessities to health care, education and highly diversified entertainment. 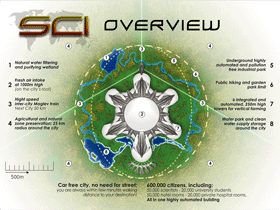 StarCity International (SCI) is a non-profit, non-government and non corporate controlled organization. Its research and development activities are open sourced. That is to say, the entire world can contribute to the advancement of the latest state of technology, as well as benefit from it. StarCity International (SCI) will be the home of 50 000 leading scientists synergistically supported by 500 000 people. 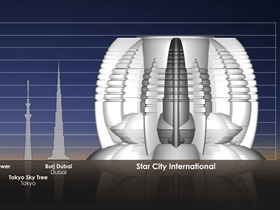 StarCity International (SCI) consists of one single huge building city, that will be the largest, tallest and most technologically sophisticated building ever erected. 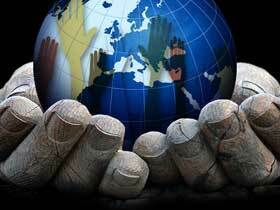 environmental concerns and highly automated systems. Most of the daily basic labour and transport will be done and supervised by computers and automated systems; like robots and AGVs (Automated Guided Vehicles). 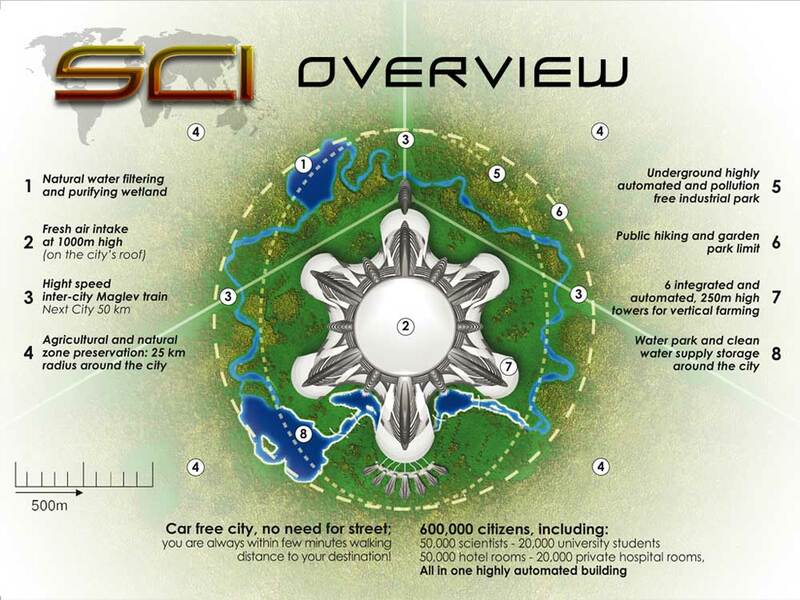 Among the multiple advantages of being part of this exclusive community, every resident of StarCity International (SCI) will benefit first hand from the science advancement and the technological breakthroughs achieved by our leading scientists. As the science and technology developed at StarCity International (SCI) will spread to the rest of the world and as everyone on the globe will start to benefit from these achievements as well, our society will gradually enter in a new Golden Age Era, where everyone will, one day in the future, be able to eventually enjoy a life with no hunger nor disease and where all the work, that no one wants to do, will be done by automated systems. StarCity International (SCI) is a community specially designed for all those who really care about the future of mankind.